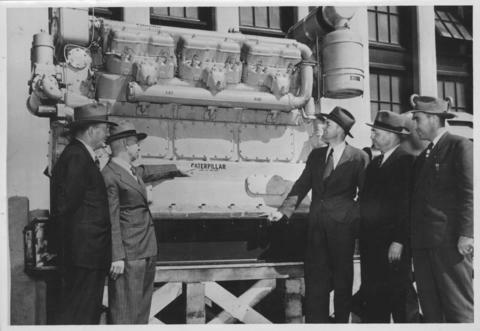 Photograph shows (L-R): N. S. Bubbis (General Manager, Greater Winnipeg Water District), F. G. Morton (Engineer of Pumping Stations, City of Winnipeg Engineering Department), Dr. A. E. Berry (Director of Sanitary Engineering, Ontario Department of Health), W. L. Wardrop (Engineer of Water Works and Sewage, City of Winnipeg Engineering Department). - Stamp (on verso): City of Winnipeg - Engineering Dept., Water Works Division, Ross and Tecumseh. - Photograph likely taken at time of 1950 flood, [1950? ].